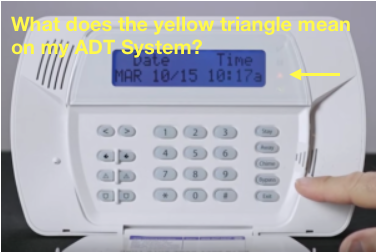 Do you own an ADT DSC Impassa alarm system, and have you noticed a yellow triangle symbol on your DSC ADT Alarm system? Is your system beeping twice every 10 seconds? You may be wondering what it exactly means. No worries, we have the answers! Let’s quickly discuss what the appearance of this yellow shape means and what you need to do. A yellow triangle on your DSC ADT Alarm system is also known as a “trouble light.” That means if you see this symbol, your system has an issue that you need to resolve. AC Power Loss – You’ve lost power. You’ll know this because the keypad will not make a beeping sound, but it will be lit up. Check the outlet where you plugged in your system. Phone Connection – There could be a problem with the telephone line. Zone is open – There is an issue with a zone. You can press 5 on the keypad to see which zone is currently experiencing an issue. Zone Tamper – One of your zones has been meddled with. You can press 6 on the keypad to figure out which zones you need to address. Time and Date – Your system clock is messed up. Just update to the correct time and date. As you can see, you’ll be able to fix a majority of these problems without help, but if you need ADT Customer Service, call them at 1-800-238-2727. If they didn’t answer your question, or you need extra help, feel free to give us a call here: 1-800-871-2119. As an Authorized ADT Dealer, we’re 100% dedicated to making protecting your home and loved ones easier than ever. The ADT DSC Impassa alarm system is super popular, and it’s a great option for protecting your home or business. Additionally, if you happen to have any other questions about it, we actually answered the top 15 questions about the ADT DSC Impassa system. You can also view the user manual for any other information you may be needing to make sure you’re utilizing all the benefits on your ADT DSC Impassa system. Want to add more wireless devices to your ADT DSC Impassa Alarm system? Check out the options and prices here. We can even help you add them yourself. Also, if you happen to have a question we haven’t answered yet about the ADT DSC Impassa system, go ahead and leave a comment below, and we’ll get to it as soon as possible! Good day if the yellow lights came on is it may be someone who mess around on my system it shows communication i do have a radio connected to security firm. The reason i ask i believe somebody is also hacked on my system. I recommend you test your system with the monitoring station if the communication trouble is still on there. How do you reset the clock. It shows clock need reset when I press star 2. I replaced the battery that you sent. I would check and make sure you know where it is and make sure it has new batteries. If those are ok, then I would replace it. I replaced battery in one zone, but the trouble light stays on, it is labeled living room 1, how do I clear the trouble light? It should clear on its own if you solved the issue, if you are seem to be running into a wall with the issue please call the monitoring station and see if they can provide additional insight as to what it could be. After i click *2 to read the message, there is no message present. It just says to hit # to exit the screen. After I do that, the trouble light stays yellow so I dont know what the exact issue is. If it is not showing you what is causing the trouble light I recommend you call the monitoring station so they can help you troubleshoot it. If its an issue with a sensor being tampered with or open than check that zone. It could be a communication problem with the monitoring station, so call and test your system, etc… So just look into it and if you need help let us know or call the monitoring station.